Chiang Mai (Thai: เชียงใหม่) sometimes written as "Chiengmai" or "Chiangmai", is the largest and most culturally significant city in northern Thailand. 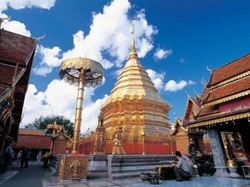 It is the capital of Chiang Mai Province, a former capital of the Kingdom of Lanna (1296–1768) and was the tributary Kingdom of Chiang Mai from 1774 until 1939. It is located 700 km (435 mi) north of Bangkok, among the highest mountains in the country. The city is on the Ping River, a major tributary of the Chao Phraya River. Chiang Mai means "new city" and was so-named because it was the new capital, founded in 1296, succeeding Chiang Rai (founded 1262) in the capital of the Lanna kingdom. In recent years, Chiang Mai has become an increasingly modern city and has been attracting over 5 million visitors each year, of which between 1.4 million and 2 million are foreign tourists (depending on the year). Chiang Mai gained prominence in the political sphere in May 2006, when the Chiang Mai Initiative was concluded here between the ASEAN nations and the "+3" countries (China, Japan, and South Korea). Chiang Mai is one of three Thai cities contending to host the World Expo 2020. It has also recently positioned itself to become a Creative City and is considering to apply for Creative City Status with UNESCO. Chiang Mai's historic importance is derived from its strategic location on the Ping river and major trading routes. While officially the city (thesaban nakhon) of Chiang Mai only covers most parts of the Mueang Chiang Mai district with a population of 160,000, the urban sprawl of the city now extends into several neighboring districts. This Chiang Mai Metropolitan Area has a population of nearly one million people, more than half the total of Chiang Mai Province.